Happy Valentine’s Day!! I can’t believe we are already six weeks into 2019! I hope 2018 was a wonderful year for you, and that 2019 is off to a great start, full of peace and happiness. I would like to make you a special offer, but first, want to bring you up to date. These last few months have been very busy for us, with guests booking at the fastest pace in years. As you are already part of the Refugio community, we would really love to have you back this year. So if you’re thinking about coming to see us, please book soon to make sure we can save your spot! Book a 2019 retreat before the end of next month (March of 2019) and stay three extra days. For example, if you pay for a 9-day retreat, you will stay 12 days. ~ The minimum for this three-day offer is a 9-day retreat. 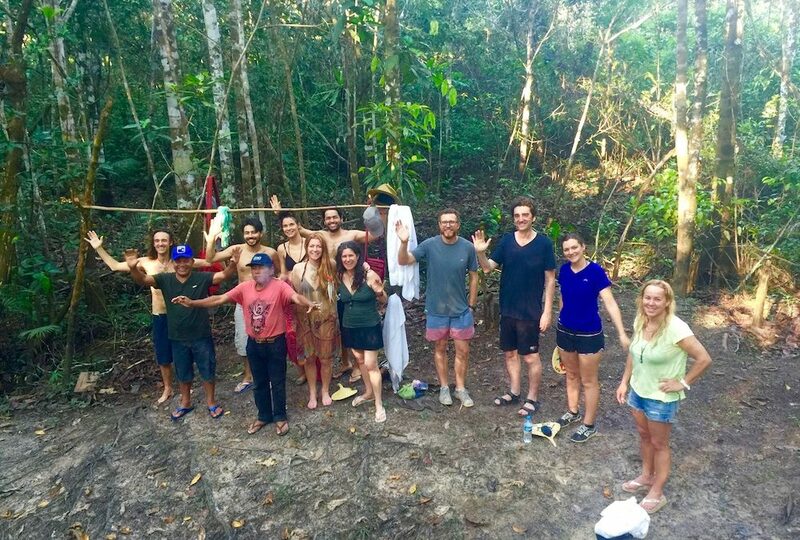 Sign up for a 9-day retreat, and stay for a full 12 day retreat with 7 ayahuasca ceremonies. ~ If you sign up for a 7-day retreat, you can stay for a 9-day retreat with 5 ayahuasca ceremonies. We’ll extend this offer to another guest, or guests, that accompany you, if you decide to come with a friend or two. Simply make a 50% deposit before the end of next month, March, to lock in your spot. The 2019 retreat dates are located here. Although we have many guests booking, please don’t worry: we stay committed to a maximum of 10 guests per ceremony and will not exceed this number, as we prefer to keep our ceremonies intimate, allowing the shamans to give you the attention you need. While thinking this over, check out the link below to see pictures from the river and around the Refugio. You may also enjoy listening to my recent interview about Refugio Altiplano on “The Herb Walk with Jessica Baker”. Jessica holds a Master’s degree in Traditional Chinese Medicine, is a full-time practitioner of oriental medicine, and first visited the Refugio in 2017. Interview: Ayahuasca – Jessica Baker and Kelly Green. We hope to see you soon! Sending out peace and light to all of you in our global community. Since denial is no longer a river in Egypt, you’ve decided to conquer your addictions by going to an Ayahuasca retreat in Peru. According to statistics over 2 million people, in the United States alone, are addicted to opiates, 1 billion worldwide to cigarettes, over 20 million to injection drugs, and alcohol dependency, affecting over 300 million people globally, which is legally consumed in most parts of the world, is responsible for a staggering 3.3 million pointless deaths per year, doing unprecedented harm to individuals and their families. The list of varying addictions goes on, as you can well imagine. It is rare to come across a human who hasn’t been affected, either directly or indirectly, by addiction. Therapy seems to be a luxury only those with money can afford, while rehab centers across America spit out a pitiful 8 percent success rate. By contrast, a Peruvian treatment center, in which patients stay for nine months, undergo traditional psychotherapy and a variety of healing practices, including numerous Ayahuasca ceremonies, say that sixty percent who complete the program remain drug free three years after leaving, many even longer. Substance abuse has reached epidemic proportions, stretching its tar stained tentacles into every pocket on the planet, and destroying an untold number of lives. With treatment programs proving to be a virtual failure, many are now turning to Ayahuasca as a last ditch effort to save themselves. If you decide to drink Ayahuasca to help overcome addiction, however, it is vitally important you set serious intent that this is what you want from the medicine….or you will likely depart the realm of butterflies feeling sorely disenchanted. There are people who have drank Ayahuasca hundreds of times, yet their addictions became more prevalent than ever. How could this be, when so many have experienced such great success in just a few ceremonies? Do they suffer from a chemical imbalance that sleeps undiagnosed under layers of vices? Or have bad habits become such the norm of day to day life, they’ve forgotten what it’s like to live without them? Once we ingest Ayahuasca, the medicine gets to know us on a very intimate level; psychologically, spiritually, physically and emotionally. We cannot hide from her all Seeing Eye, yet inevitably she will adhere to whatever assistance we ask for. Therefore, if we have an addiction but don’t see it as a problem, we’ll still go home a changed person, though unavoidably stay locked in patterns that keep us cycling in dysfunction. When it’s all said and done, there is no magic pill that will miraculously change us overnight. We must do the work! But as far as Ayahuasca is concerned? She’s a remarkably effective catalyst in setting us on that most empowering path. She’ll take us down the proverbial rabbit hole into the farthest recesses of our subconscious, where we can at last discover the root cause of whatever got us addicted in the first place. Was it a form of childhood abuse? The death of a loved one? War? Genetic predisposition? Apathy? Rest assured, whatever the cause, she will show you what you need to see in order to help break the chains that bind you. Disclaimer…be prepared for moments of unpleasantness, as the fragile mirror that is the self gets shattered and remade. Remember that this is totally normal, and everything is going to be better than just okay in the end. No one gets to the promise land without first walking through the valley of thy shadow, yes? You are wiser and stronger than you know. The time has come to let the walls of limitation crumble, so your spirit can finally fly free. Related article: Ayahuasca Retreat What is it? If you are reading this, it means you are considering an Ayahuasca retreat in Peru. And for that I wish to congratulate you, as herein lies one of the most powerful, life-changing events we, as humans, could ever hope to experience. Whether our struggle be with substance abuse or addiction, varying degrees of depression no amount of therapy could fix, loss or grief we cannot move past, or simply the calling to expand our consciousness. Without a measure of doubt, you will never be the same after drinking Ayahuasca. The reasons a person chooses to drink Ayahuasca are vast, as we are all unique individuals with our own backstory. Thus, one doesn’t have to be “messed up” and in need of great healing to partake in Ayahuasca, though that is sometimes the case. We could be a happy, content human being who’s never had any trauma, afflictions or heartache. Or we might be at our wit’s end, with no or little hope at ever finding or regaining a happy life. What unifies each seeker, however, is a yearning for change and self-discovery. A desire to grow on an emotional and spiritual level so we can better understand our place in this crazy world, in the hopes we can finally see ourselves in a much higher light. That’s what I wanted, anyway. And Ayahuasca will give us whatever it is we are intending to find, be it healing, letting go of whatever needs letting go of, or just to experience it for the sake of experience. It is a journey that has no end, and knows no bounds. 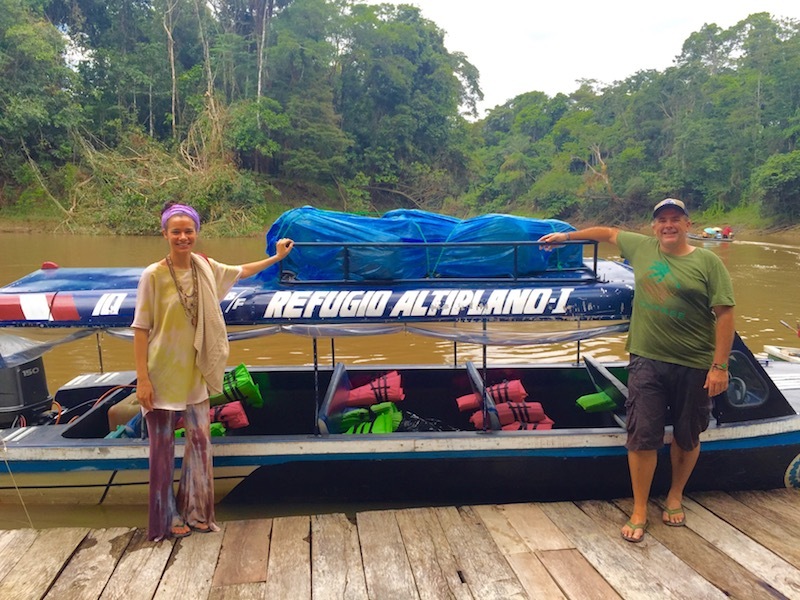 When I told my family I was going to spend a month in the rainforest drinking Ayahuasca, the first response I got was fear. Their fear. The dangers and the horrors of what could, and has gone terribly wrong! I could die! Didn’t I care? Ayahuasca is a drug, for god’s sake, and drugs are bad unless approved by the FDA! Etc. and so forth came the woes of their utter dismay, and paranoid assumptions. Do yourself a favor, fellow seekers, and ignore the naysayers. Better yet, if up against such cynics, keep your personal journey to yourself. Because first and foremost, this adventure is all about you! Follow your heart and educate yourself by taking the time to do some research. The rest will fall naturally into place. For those who are unclear, Ayahuasca is a medicine, not a drug, and has been used by the indigenous people of the Amazon region for thousands of years. It is a brew made by boiling the leaves of the plant Psychotria viridis, together with a vine called Banisteriopsis caapi. The end result is an extremely potent tea containing a psychedelic chemical compound known as DMT, which is structurally similar to serotonin, and also occurs endogenously in the human brain before birth, while we dream, and upon death. But what does that even mean? If DMT is released during dream states, that’s an enormous complexity of any and everything is possible, right? Right. Therefore one cannot adequately explain the infinite types of experiences one can, and will have, under the influence of Ayahuasca. You must discover it for yourself. Having made the decision to ingest the Vine of the Soul, as Ayahuasca is often referred, I began my research. This came in the form of YouTube, where I spent five hours watching one testimonial after another, which led me to various articles online, which led me to find the right retreat center for me. Ayahuasca is a consciousness unto itself, the most sacred of plants, and deserving the utmost respect. So if you’re going down this road, I highly advise you to find a retreat center that is long-standing, whose reputation is outstanding, and who only employ shamans of the same caliber. Don’t just pull a retreat out of a hat. If you required surgery, wouldn’t you want the most qualified surgeons? Indeed you would. After all, your very life is in their hands. Your center has been chosen, and the date set for your Ayahuasca retreat in Peru. Now comes the part of getting ready. When browsing various center websites, I found it pretty standard to avoid the following at least one week before ceremony: fried foods, spicy foods, fermented foods, caffeine, canned or packaged meat and fish, liquid and powdered protein supplements, brewer’s yeast and yeast based supplements, dairy, overripe fruits, sugar, processed foods, excessive salt, and sexual contact. Yes, you read that last one correctly. Also, it is advised to stop alcohol and recreational drugs, including marijuana, at least two weeks prior to ceremony. Stopping for longer than two weeks, however, certainly won’t hurt. Full-disclosure moment. One of the reasons I traveled to Peru to drink the jungle brew was to lose my dysfunctional love affair with alcohol. Therefore…..no way did I abstain for two weeks prior! In fact, I drank right up to the eleventh hour. But my diet, other than that, had been exceptional for a very long time: all organic, not much dairy, hardly anything processed or fermented, no meats except chicken and fish a few times a year, plenty of fruits and veggies, sparse amounts of sugar and marijuana, and regular exercise. When I read what foods to avoid I thought, hell yes! I’ve practically been on an Ayahuasca diet for years now and didn’t even know it! This’ll be a cakewalk as far as the purging process goes. Woo hoo! Never in my life have I experienced a physical flush like the one I got during my month with Ayahuasca. Never. In. My. Life. Where was all this stuff coming from? I hardly ate anything for days and days, yet the gunk kept rushing full force on out of me! Apparently, especially for us first timers, even if we have relatively clean lifestyles and follow the recommended pre-diet plan, no one escapes the almighty purge. Ayahuasca saturates into every nook and cranny in the body; into every cell and atom, through each organ and vessel, right on down to the very marrow of our bones, extracting everything that doesn’t belong there; toxicity from foods, our environment, a lifetime of stress and bad habits, you name it. She’ll scour your body like a fine tooth comb until there’s nothing toxic left. Definitely, be prepared for that! Another thing I did was set my intentions on what I wanted. Aside from the alcohol issue, I longed to feel alive again. Having spent too many years dealing with one trauma-drama after another, I had lost my zest for life. I didn’t care if a bus flattened me to the pavement on any given day, and had become extremely bored with the yawning monotony of day to day reality. Earth sucked. People sucked. Everything sucked. I also wanted my creative fire to spark back to life, as I had lost it some time ago. For a creative person, when inspiration goes dark, it’s like someone snatched every rainbow and flower from the world and turned off the sun. Totally bleak. Outside of those immediate personal needs, I also wished to see my father, who had passed away, and maybe tap into some previous lifetimes if possible. The last thing I did before I left, and this might sound a little corny to some, was I started having conversations with Ayahuasca. Being the embodiment of wisdom and healing I knew her to be, I confessed all my icky garbage, what I wanted help with, and asked her to show me everything I needed to see in order to grow, no matter how ugly and unpleasant. So there you have it. Pretty easy to prepare, right? Clean up the diet, quit the booze and drugs, and set intentions. One last thing…try not to be afraid. I get that’s easier said than done, but just know that you are safe and protected. Remember to trust in the process, breathe in deep, and relax. Life, as you know it to be, is about to change forever. Enjoy it, my friends. This is the opportunity of a lifetime! One you won’t regret. You’ve decided to do an Ayahuasca retreat in Peru. Check. Now comes the next big step of, where the heck to go? As there are so many centers to choose from down there, it can be a truly daunting task in finding the right one for you. I knew very little about Ayahuasca when I began to plan my trip, let alone which center would be best for me. So after listening to a few dozen testimonials on YouTube, and reading one article after another about Ayahuasca, I hit retreat center websites and began my search. Next, I wanted to know the maximum amount of people allowed in a ceremony. Some places have dozens of participants, while others have even more. I wanted mine simple, low-key, intimate and cozy; no more than fifteen, ten was even better. This narrowed my search down a bit and helped me ex out loftier centers, which had various perks such as art therapy, yoga classes, daily steam, and floral baths, massage, etc. Those things are totally awesome, but the amount of people flocking to such a center exceeded the intimate atmosphere I was looking for. If I want yoga, I can do it myself. If I want art therapy, I’ll take my mandala coloring books with me…which I did. Next, I wanted to make sure a medical intake form was required. If a center, at the very least, doesn’t ask you about current or past medications… DO NOT GO THERE! A huge red flag of gross negligence. Anti-depressant’s, for example, is a major contraindication when drinking Ayahuasca. The two are not friends, and never will be. In conclusion, I wanted a center that was peaceful. One that allowed me space and solitude to process each ceremony, as well as the company of wise shamans to process these changes with me. I wanted the comfort of knowing I was safe, protected and watched over. Talk to the owners of prospective centers and ask questions. If they are devoted to their retreat, they will be more than happy to connect with you via chat, email or telephone, as needed to ensure you make the right decision for you. If they feel you might be better suited at another center, they will refer you out. If you wish to speak directly to past guests, ask if this can be arranged. Firsthand experience is always refreshing and was a major factor in solidifying my retreat. Most importantly, and I cannot express this enough, listen to your heart and let your intuition guide you. You are in charge of you, and feeling things out. Knowledge is power! Do the legwork, research sites, ask questions, and the next step of your wondrous journey will soon begin.